Jergens + Protect Daily Moisturizer Review (2018): Is It Worth Buying? Jergens Natural Glow + Protect Daily Moisturizer with Sunscreen Review: Ingredients, Side Effects, Detailed Review And More. What Is Jergens Protect Daily Moisturizer? 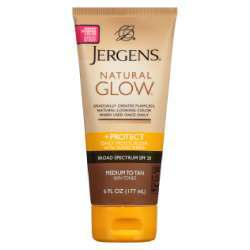 Jergens Natural Glow + Protect Daily Moisturizer with Sunscreen is a cream that protects the skin from the rays of the sun. This product moisturizes the skin and gives the skin a natural looking flawless skin. Jergens Protect Daily Moisturizer- Does It Really Work? This product contains ingredients that promote a natural-looking summer glow after applying this cream. Using this moisturizer enables the skin to have a natural looking color after a short period. Reviews on this cream claim that it produces a natural and beautiful looking tan in a few days. The cream hydrates and moisturizes the skin to provide protection from the UV rays. Also, it does not stick if applied correctly. To acquire best results the user should apply Jergens + Protect Daily Moisturizer all over the body and allow the product to dry. Avoid direct contact with the eyes. Therefore, wash your hands properly after application. The cream should not be applied to the broken skin and if irritation or rash occurs stop using this moisturizer. When applied once every day, the cream may gradually aid in creating a natural looking color. The cream is available online and costs $7.49. What Are The Ingredients In Jergens Protect Daily Moisturizer? Octinoxate which provides for the skin from damage. Glycerin which aids in moisturizing the skin and preventing scaly and rough skin. but also can cause skin irritation to sensitive skin. Fragrance which gives the cream the desired scent. Citric acid which aid in treating acne, pigmentation and sun tanning. However, in rare cases, it can cause allergic reactions, irritation, and rashes. Apply this product all over the body evenly, smoothen out the cream on the skin and give it several minutes to dry. Wash your hands after each application. For best results, apply Jergens Natural Glow + Protect Daily Moisturizer with Sunscreen on a daily basis to see a subtle color development within days of use. For sunscreen use, generously apply every 15 minutes before exposure to the sun. Reviews suggest that it is essential to repeat the process every 2 hours. Provides protection from sun rays. Enhances the texture and tone. Does Jergens Protect Daily Moisturizer Have Any Side Effects? Jergens + Protect Daily Moisturizer side effects are mild to none. The cream should not be used on the broken skin, and reviews claim that if irritation occur stop using the cream. Jergens + Protect Daily Moisturizer may aid in boosting the tone and texture of the skin hence the user may acquire a smooth and soft skin. Also, it reduces the pigmentation and acne so the user might have a flawless look. This cream might protect the skin from the UV rays when applied on a daily basis and prior to skin exposure to the sun. Additionally, the cream may provide a natural looking color and promote the appearance of the skin. The cream prevents the occurrence of itchy and dry skin. This cream moisturizes the skin hence may enable the user to improve the health of the skin. Reviews suggest that increased hydration may aid in boosting the health of the skin and proper function. For best results, apply this cream regularly on a daily basis. This cream is available online, and the users can apply it all over the body on a daily basis. However, the cream is not suitable for application on broken skin, and it contains a fragrance that produces a scent. If irritations or allergic reactions occur, the user should stop using this cream.